As a new comer to the Android HTC smart phone scene, I ‘ve discovered how uncomfortable it is to type in passwords in public using my phone, therefore I don’t. Apparently Intryca have caught on to that and plan to make it all better. Intryca, not the developers of the ridiculous Blackberry visor shown here, is a startup that originates from the University of California at Santa Barbara have come up with some high tech cryptographic technology in the shape of a smart phone app that builds it’s security concept around smart phone hardware rather than software. Meaning it is a lot easier to use, and definitely more secure than simply a password. Utilizing the fact, as humans, no two hardware devices are exactly the same, Intryca plans to identify not only you but your phone also as one secure unit that you can use for applications requiring strong authentication, e.g., Internet banking, mobile payment systems, access to bank ATM’s, and mobile identity checks for governmental agencies. The 3 man startup co-founded by Jordanian Ghaith Hammouri has won a $150,000 grant from the National Science Foundation, which is an American federal government fund designed to encourage and stimulate research and innovation in science and technology. 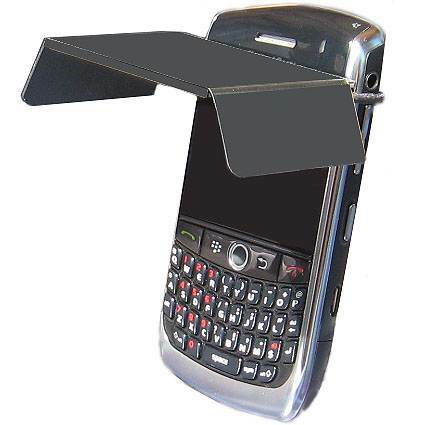 They plan on launching the application targeting RIM, Apple and Google for the BlackBerry, iPhone and Android sometime this year so keep an eye out for this one, or go out and buy the silly visor shown above.